This is a just a quick post about Pinnacle studio 14, I use this mainly just for quick edits on the home videos I do as well as the videos that are uploaded for on here, normally just basic edits and nothing fancy. Though I decided that having a bit of time would try out some of the different effects within the software, so have a look at the video at the bottom of the article with some of the different affects that i used that are available within Pinnacle Studio 14 HD. I use to do loads of video editing years ago when the kids where young, but then moved back into still photography about 5 years ago. I use to use Videostudio by Ulead (now owned by Corel) this was great for Standard DV footage, easily record from Mini Dv Camera, split into scenes etc and then add loads of different effects, transitions, text etc and at the time output to either VCD or SVCD, as at the time blank DVD’s were a lot more expensive than blank CD’s :-). But then I moved to still image photography, so didn’t use the old mini dv camcorder, I had several camcorders over the years including std video 8 formats, then hi-8 then onto mini DV, which I still have a Samsung mini dvd palmcorder, I do miss one of my old mini DV camcorders that had a infra-red recording mode, this records in the dark using infra-red and produces green images like on tv shows like Most Haunted etc. Even though I have had some good digital cameras over the years the movie modes weren’t that good most only at 630×480 resolution and most couldn’t use the optical zoom while filming, and to be honest lost interest the the video side, but now I use the Panasonic DMC-FZ38 bridge camera which has a 720p mode saving the files in either motion jpeg (m-jpeg) or AVCHD Lite with good stereo microphone. I do use the movie mode now alot more, that combined with a fast 8GB SD card can get loads of images aswell as alot of video footage in one device. Since moving into HD video the software I used Videostudio did support HD, but to be honest support wasn’t that good, in my opinion the ulead range of software was great before corel took over ulead. I decided to go for pinnacle studio 14 prices which now start from approx £40. This is a very good video editing suite with load of different effects than can be easily added to any video clip, importing video clips is very easy. The titling editor is very easy to use. You have several different ways of viewing clips, audio etc you have a storyboard view and timeline view, each one has its advantages and very easy to switch between then. to add effects to a single clip easy as double clicking on the clip with either view and then opens up the video editor mode, from here you can add different effects, trim clip, edit overlay, ads text etc. you can easily add multiple effect to any clip. To edit HD video you do need a pretty powerful PC, as the software renders the video clips in the background, which does make it faster, but can be slow if you add some complex effects to a clip. 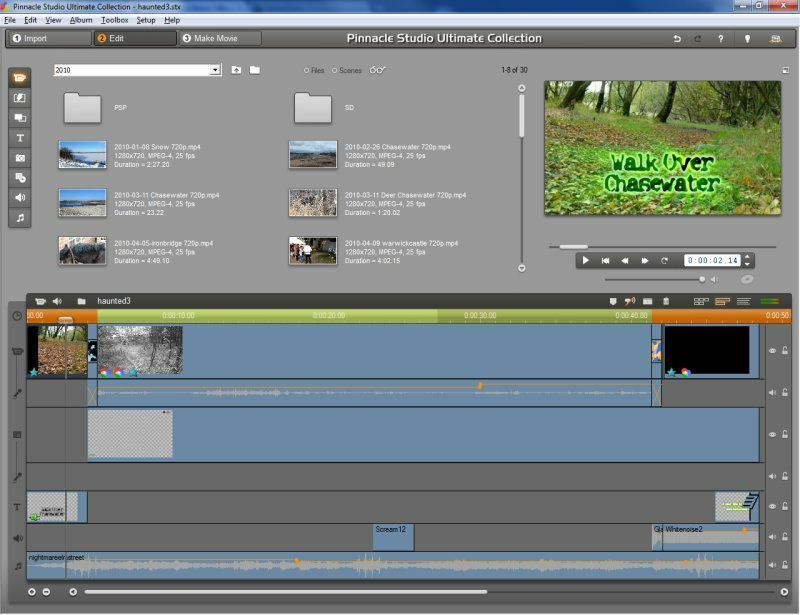 I would definitely recommend Pinnacle studio for video editing, I did try over the weekend the new Adobe premiere elements 9, but unfortunately the trail version doesn’t completely support the AVCHD .mts format as when you import you get no sound on your clip, you do get some good effects and the layout does work well. but I still prefer pinnacle studio for more details on the software goto to pinnacles website here.